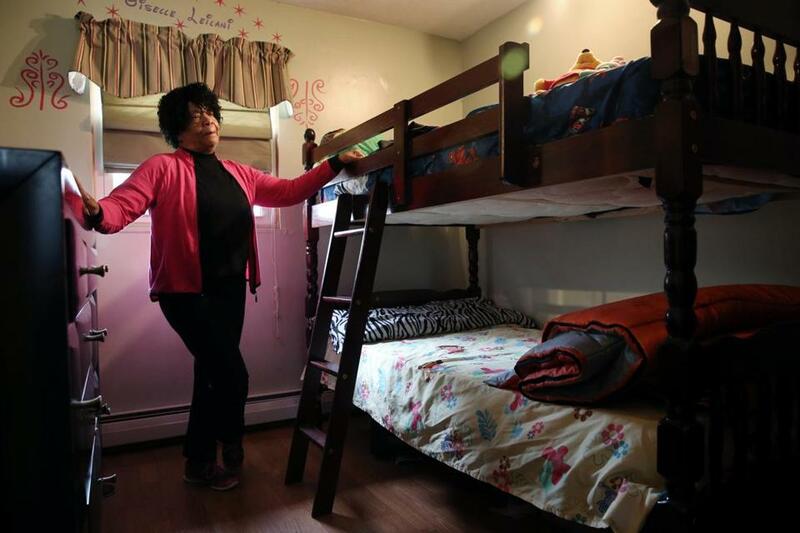 Gloria Gilmore showed a spare bedroom at her home in Brockton. She and her husband are involved in a custody case for two of her grandchildren. “I really wish somebody had picked up the phone and called DCF and reported some of their concerns,” Governor Charlie Baker said in September, after 2-year-old Bella Bond was found dead in Deer Island. The statement made Gloria Gilmore scoff in disgust at her television, she said. Gilmore, 66, had called DCF, and now is engaged in a legal battle for custody of her two young grandchildren. So far, she is losing. Mired in subplots of substance abuse and homelessness, Gilmore’s saga is a snapshot of how tough it can be for the Department of Children and Families to sift through unfounded claims, some of which come from family members. In this case, a father who has been in trouble with the law says he has turned things around and is trying to keep his family together; a mother who is an admitted drug user has relinquished all claims to custody; and a grandmother -- Gloria Gilmore -- says she is stepping to prevent what she characterizes as a ticking time bomb. A new report by the Pioneer Institute calls on the agency to retool the way it responds to allegations of abuse and neglect. Read: Can analytics help fix the DCF? Gilmore claims her grandchildren’s guardian used drugs in their presence and forced them to miss school to panhandle with him throughout Boston. The guardian, 32-year-old Jason Tench of Dorchester, denies using drugs and said the children’s grandmother is lying and acting on her bitterness about her own daughter. So who gets the kids? A family court judge denied Gloria Gilmore’s emergency petition for guardianship of Deja Tench, 5, and Ajhier Gilmore, 6, on Aug. 30, court records show, after DCF found “no present concerns” about her grandchildren staying with their current guardian. Jason Tench is her daughter’s former boyfriend and the father of the 5-year-old. Tench is also a man with a checkered criminal past and present, but who claims -- with some supporting evidence -- to have turned his life around. The looming question for child welfare experts is how to decide what safe is? The case is a typical example of what DCF often faces, said Susan Elsen, Director of Child Welfare Reform Project at Massachusetts Law Reform Institute in Boston. According to a 2014 report published by the institute, 57 percent of DCF’s caseload of families with very young children involve substance abuse. While she did not comment on the specifics of this custody battle, Elsen said that when DCF workers investigate child neglect and abuse allegations, their first strategy is to work with the guardian at the child’s current residence. The other option for DCF is to remove the child from the home to ensure safety -- but only if they see a risk. A spokeswoman for DCF said the agency would not comment. Gloria Gilmore, the concerned grandmother who lives in Brockton, said Tench presents a risk, and she has taken action. Gilmore and her husband, John Gilmore, are seeking full custody of both toddlers and the final court decision is expected Dec. 10. The family’s odyssey began in 2012 when Gideanne Gilmore, Gloria’s daughter and the mother of both children, voluntarily released custody to Tench, court documents show. Tench is the biological father of the youngest child, and at the time, Gideanne Gilmore believed he was more financially secure and able to care for her children, she said a recent interview at her parents’ house. After giving him custody of the children, she stayed with Tench, and described a pattern of neglect during their time together. She said the two used crack cocaine, even around the children. “They didn’t go to school somedays because we didn’t wake up in time,” Gideanne Gilmore said, estimating that her children missed at least 40 days of classes under her and Tench’s care. When company would come over, the children “would sleep in the living room on the floor,” she said. The pair eventually split and Tench, interviewed in October, denied these allegations. He described Gideanne Gilmore as a drug user, desperate to satisfy her mother’s grudge against him in exchange for financial support. Having heard accounts of Tench’s neglect from her daughter, Gloria Gilmore filed for an emergency guardianship earlier this year. Court records show that Tench was arrested in August on a defaulted warrant, and has pending criminal cases in Dorchester and Quincy for check forgery, producing a false check, credit card fraud, larceny, and breaking and entering. But Tench has denied Gilmore’s allegation that the children face imminent danger and so far, DCF has sided with him. In an October interview, Tench said he pleaded not guilty to the court cases, and that his life has hit an upswing. Tench recently moved to a family home in Dorchester after years of staying in homeless shelters, and he has landed a new job. He said he reads books on fatherhood, voluntarily attends workshops on single parenting, and regularly visits a counselor. Over the phone, Tench listed several programs he completed through DCF and said has consistently passed regular drug tests. Tench insisted he is trying to keep the family together. But with the court case looming, he is reluctant to let the two children visit their grandparents, he said. Gilmore said she was heartbroken at the thought of not seeing them.